Dead man inside the water tank. More than 2,000 residents at the Taman Sri Titingan flats had been wondering why the piped water they were consuming the past week smelled bad and was whitish. 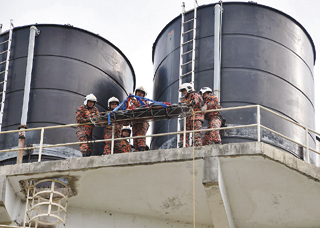 Many could not contain their anger when water maintenance personnel during a routine inspection at 9am, Saturday, found the decomposed body of a naked man floating inside one of the nine tanks atop the 60-foot tower. Police requested assistance from the Fire and Rescue Department to retrieve the body. It took four hours as firemen had to cut the water tank in order to take it out, said its chief, Rudy Fredzek. District Police Chief ACP Ibrahim Chin said initial investigations showed the deceased was in his 20s and that no injury marks were found on the body. Police believe there was no foul play involved but investigations are on-going. The flats residents committee chairman, Abdul Han Ab Majid, presented a memo to the flats management demanding, among others, compensation for consuming contaminated water. They also demanded to be exempt from paying the water bills from April until the water tanks have been replaced and for security personnel to be stationed near the water tank tower. They also demanded that temporary water supply be sent to the flats with the cost to be borne by the flats management until normal water supply resumed. One of the residents, Hasbi Salamat, 32, said they were disappointed because they never thought that the water from the tap looked bleach-like because there was a corpse inside the tank. "I reported this to the management more than a week ago as soon as I noticed something amiss with the water but they only said 'we will check tomorrow'," he said. Like many others, he had to buy three boxes of bottled mineral water for consumption because he could not stand the stench from the water in the house. Hasna Bacho, 34, who had been residing there for three years said she, too, felt something weird about the water since April 30 and filed a complaint with the flats management but met with a disappointing response. Amiruddin Rasake, 43, claimed the flats management not only did not care about the residents' complaints but also never took follow-up actions including about water and electricity supply. Meanwhile, Apas Assemblyman Datuk Tawfiq Abu Bakar Titingan, who went to the scene, said the discovery of the body was shocking since there had been no reports of a missing person in the area. He urged the Water Department, Health Department and Chemistry Department to conduct a study on the water there to ensure it is not contaminated. "We don't want the people here to be at risk," he said, adding that he would also be looking at the demands made by the residents. Tawau Municipal Council president, Datuk Ismail Mayakob who accompanied Tawfiq said he would be contacting the various government departments to handle the issue. Investigations would also be conducted on the residents' claim that the flats management did not entertain complaints about the water condition, he said.